I can't believe that fall is right around the corner! I love this season because it means birthdays, holidays, and the perfect weather for fashion. This is our first fall season in this house, and I'm excited to get it all decorated and ready for the cozy season. I know that deep cleaning is usually reserved for springtime, but why can't we do that the beginning of every season? 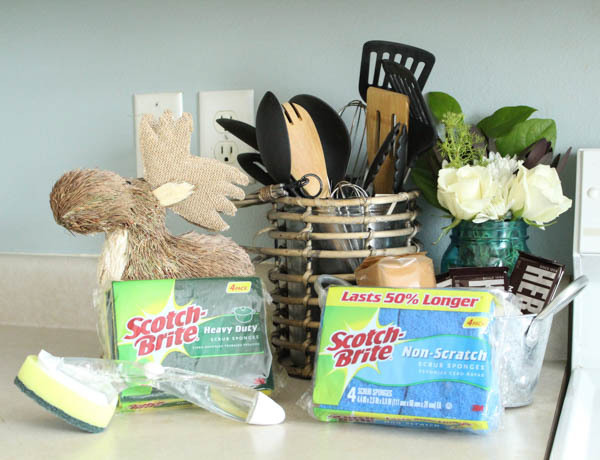 :) I picked up Scotch-Brite® Heavy Duty and Non-Scratch scrub pads as well as the Heavy Duty Soap Dispensing Dishwand to get my kitchen spick-and-span. 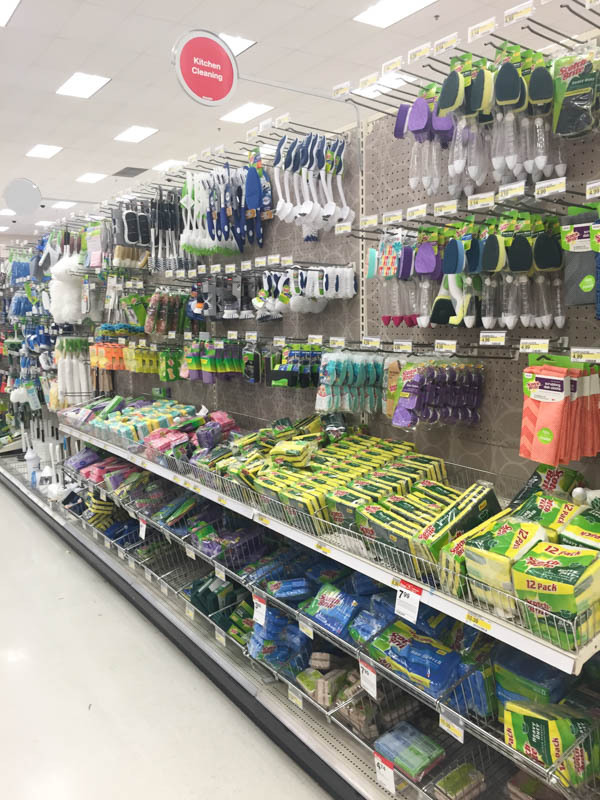 Save now on Scotch-Brite® Scrub Sponges at Target with this Cartwheel offer! This scrub sponge is EVERYTHING! I've been using these in my home for ages, and there is nothing better to get all the gunk off of my stovetop. 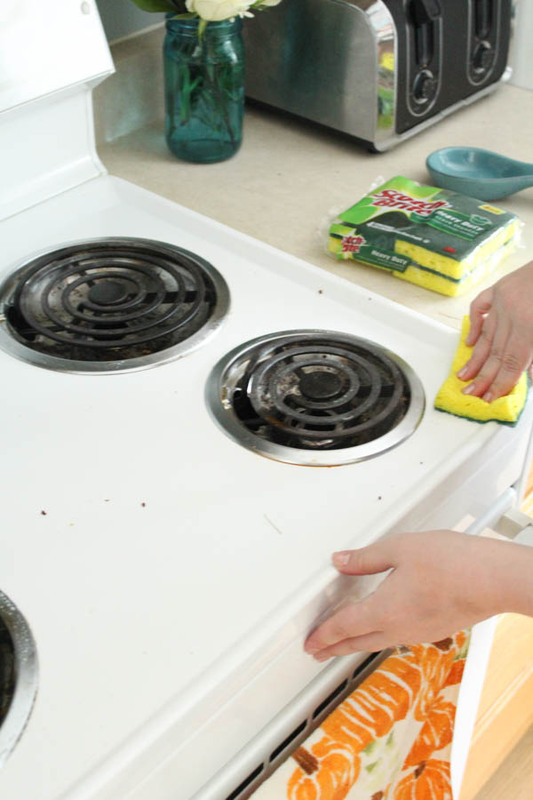 It cleans up tough stains 50% faster, especially those baked-on messes that I usually find on the stove! I always remember that the Heavy Duty is green while Non-Scratch is blue, so I don't use the sponges on the wrong surface! 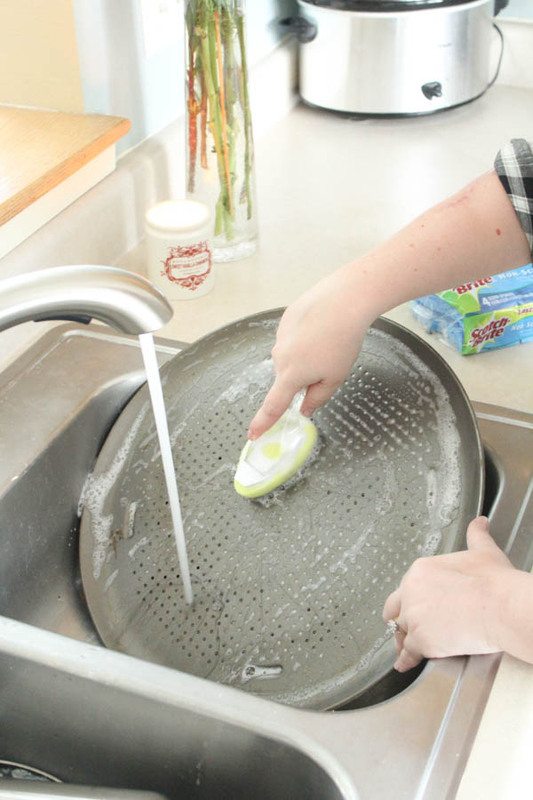 Throw on some soap, a little water, and put that sponge to work. Fresh flowers always put me in a great mood, especially when they are a festive coloring that matches the season. 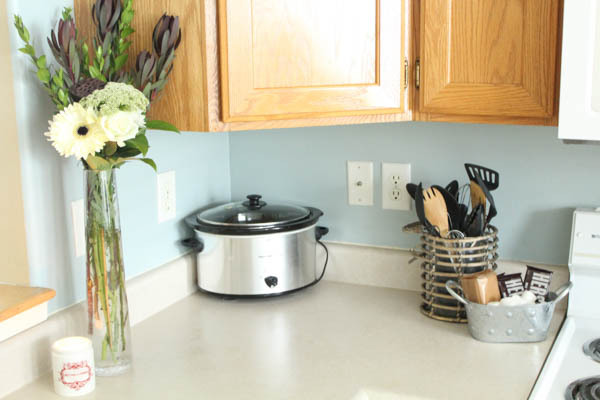 I found these perfect neutral flowers and arranged them into a couple of different vases to spread around the kitchen. 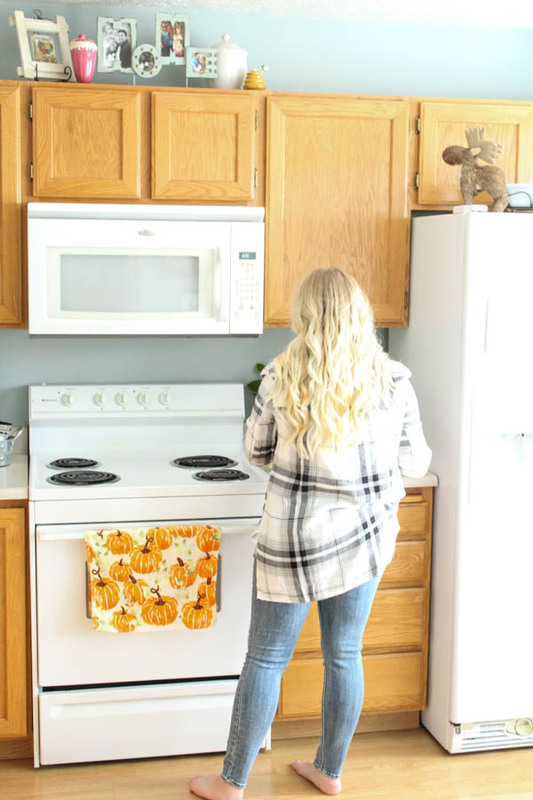 It livens up the kitchen and brings in that cozy fall feel! 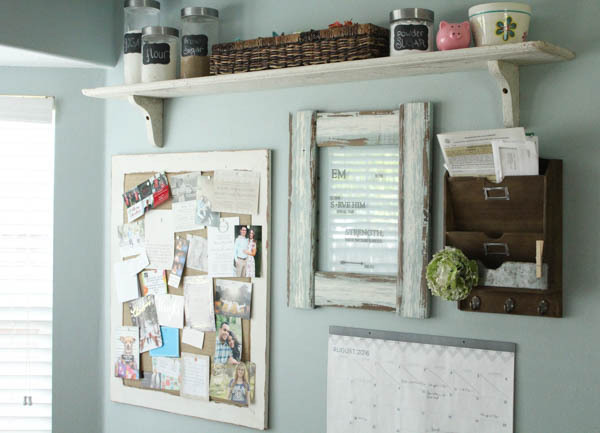 This dishwand is a total lifesaver. I love that I can control how much soap is dispensed, and that the Heavy Duty scrub sponge gets those difficult pans nice and clean. When I have the time, I scrub down those tough-to-clean pans so that they're ready for when family is in town and we're all baking dinner together. That way, I'm not embarrassed by my pans when they get pulled out! Our pans get ravaged by scrambled eggs in the morning and burgers for dinner! 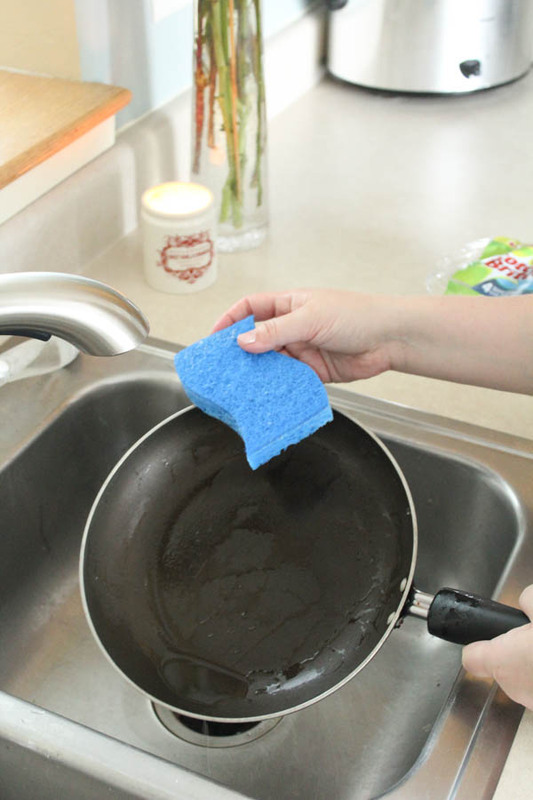 The Non-Scratch scrub sponges keep the pans in good condition, it cleans non-stick cookware without scratching. In just a few scrub-a-dub-dubs I was able to get all the mess off. Good as new! 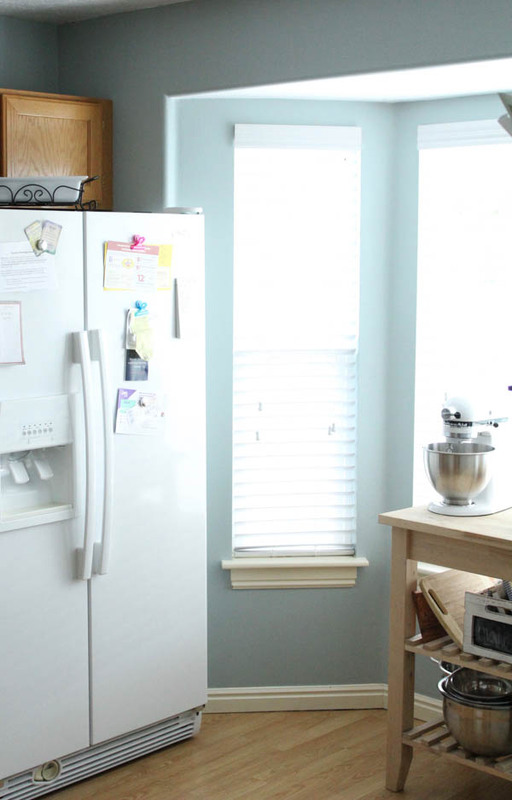 Finally, organize all the paper you've got in the kitchen! Our kitchen serves as a home-base for bills, letters, wedding invites, family calendar, and more. I went through and trashed everything that we didn't need, pinned up the new wedding invites on our bulletin board, and filed away all the paperwork we needed to keep. The only items we have on our fridge are of immediate importance, which puts it on the forefront of our mind. 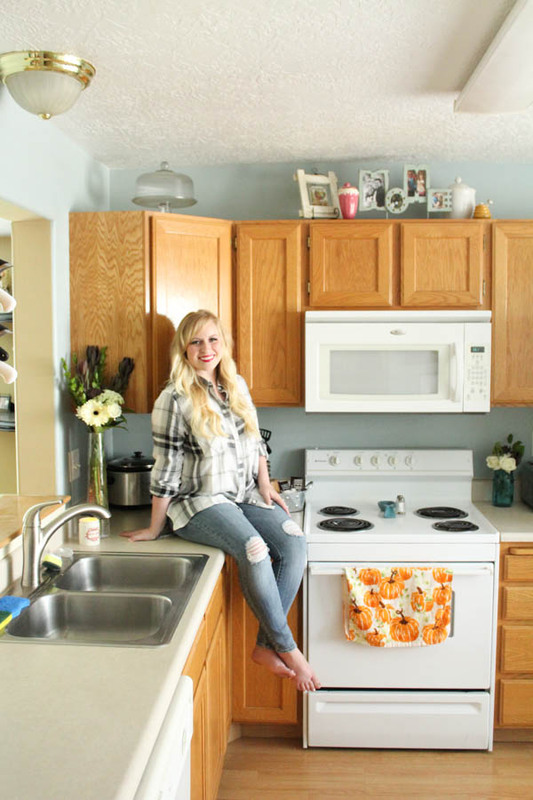 Those are all my tips and tricks to get your kitchen ready for the new season! 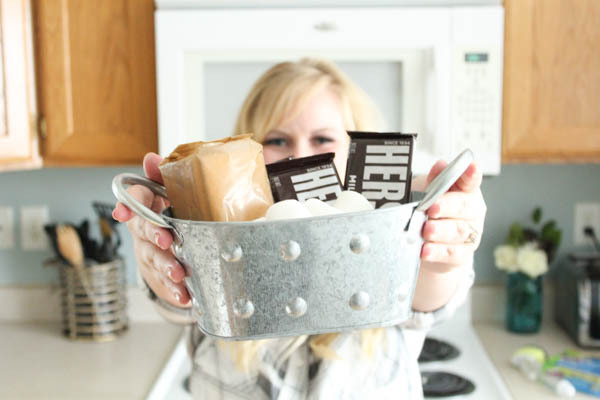 What are your go-to tasks to get your kitchen in shape? 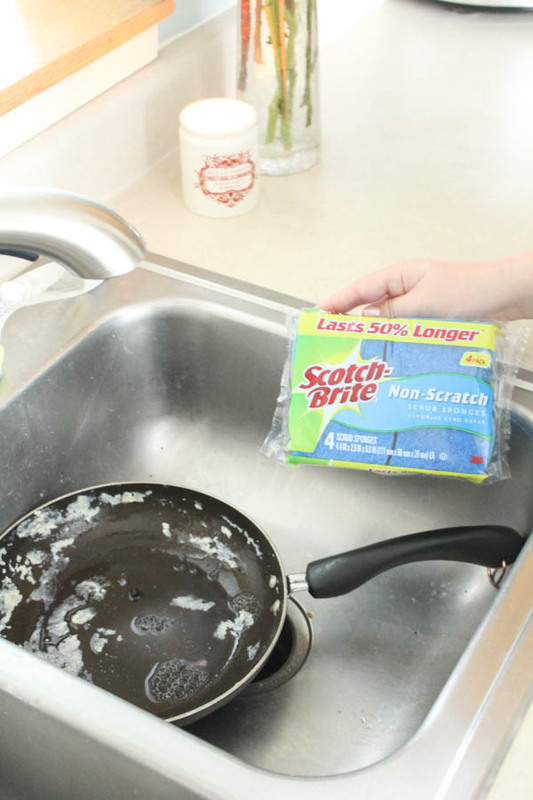 Which Scotch-Brite™ Brand product would you use the most in your kitchen? A great excuse to visit your local Target and save money when using the Cartwheel coupon for any Scotch-Brite™scrub sponge! I can't believe Fall is already around the corner! 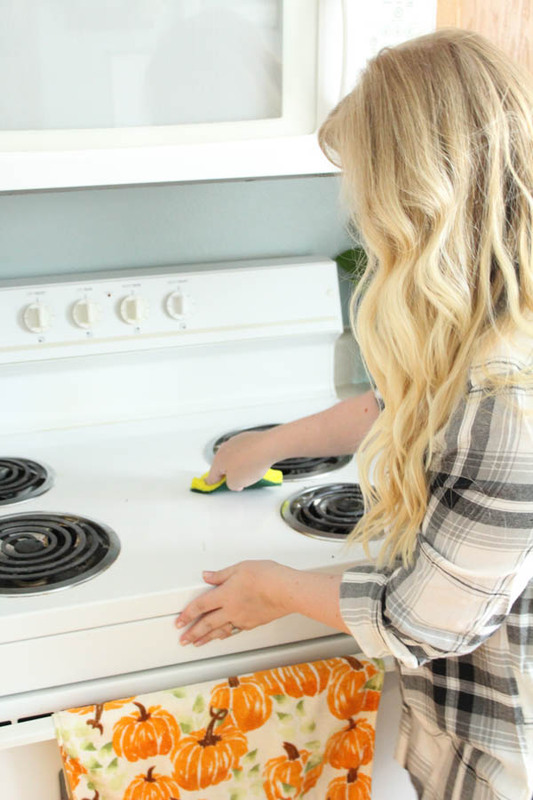 I love the idea of doing a deep cleaning every season. 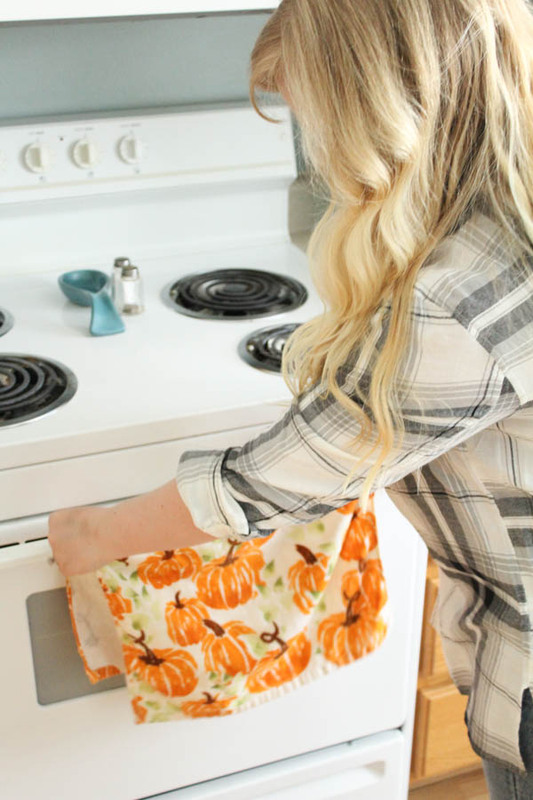 When is it too early to start decorating for fall?! I cannot wait to start, but I typically try to wait till September. However, I will say that I only use Scotch-Brite for clean my kitchen.